Craig Roberts (yes, there are two of us) is a former US Marine and a 27-year veteran of the Tulsa, Oklahoma, police force. He is a capable and committed person. Since 1989 he has written 13 books. His latest, just published, Medusa File II, consists essentially of his voluminous files of the investigation of the bombing of the Alfred P. Murrah Federal Building in Oklahoma City on April 19th, 1995, known as "the Oklahoma City Bombing." The FBI, appreciative of Roberts' capabilities, requested his service in the investigation. As officially part of the investigation, he took the investigation seriously. The investigation proceeded rapidly, developing many leads. Numerous witnesses saw Timothy McVeigh with many dark complexioned men prior to and just after the bombing. Leads were also developed to militias in Elohim City, to the German, Strassmeir, and others. Before any of these leads could be developed, the investigation was taken over by President Bill Clinton's Attorney General, Janet Reno. Once Washington took over, the investigation stopped. In its place was Washington's theory that it was Tim McVeigh's lonely protest. The voluminous evidence of McVeigh's accomplices or controllers, as might have been the case, was in the way of the official story that imposed itself on the investigation. Many people resisted the coverup that descended on the case, including local journalists who eventually lost their jobs or moved on. Roberts stuck it out to the end. So did black Oklahoma City Police Sgt. Terrance Yeakey. For resisting the official story Yeakey paid with his life. Roberts provides the reasons he believes Yeakey had definitive evidence that the official story was a coverup. The OCPD was called off once the official story was in place, but Yeakey wouldn't quit and became a problem. The official OCPD report says it was suicide, but Roberts recognizes homicide when he sees it. There was no autopsy and the police refused to release the police report to Yeakey's family. Being black, they had little recourse. Remaining skeptics were dismissed as "conspiracy theorists," and that was the end of the case. 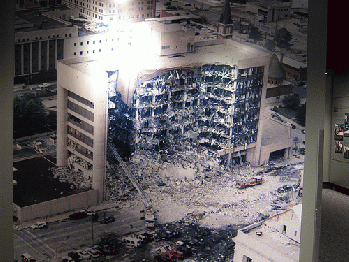 One of the striking details that Roberts provides is that in the immediate aftermath of the bombing with rescue workers removing dead and wounded from the rubble, numerous federal agents appeared, ordered the rescue workers out of the building on the grounds that there were still unexploded bombs in the building. Then with the trapped still under the rubble, all rescue efforts halted until the federal agents had removed file cabinets from the building. Roberts speculates that the cabinets contained the files of the Mena drug running operation that many believe involved Arkansas governor Bill Clinton, and that President Clinton and Janet Reno didn't want these files to see the light of day. For an official explanation of the case that relies solely on McVeigh's "truck bomb," the federal agents' statement that unexploded bombs remained in the building is a conundrum. If there were unexploded bombs remaining in the building, how could it be that McVeigh was the lone wolf perpetrator? It reminded me of General Benton Partin, a US Air Force explosive expert, who produced a detailed report proving that the Murrah building blew up from the inside out, not from the outside in. Of course, by the time Gen. Partin got his study completed, the fix was in, and there was to be no challenge to, or reconsidering of, the official cover story. Roberts doesn't know who did the bombing or why. All he knows is that leads were not followed and the case was solved by Washington and not by an investigation. Just like the assassination of JFK. Just like the assassination of RFK. Just like the assassination of Martin Luther King. Just like Saddam Hussein's "weapons of mass destruction." Just like the "Gulf of Tonkin." Just like Gaddafi and Libya. Just like Assad's "use of chemical weapons." It is endless, isn't it?